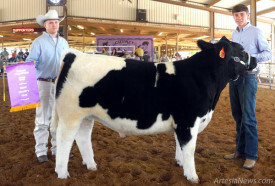 Above, Cooper Hall of the Artesia FFA shows off his Grand Champion market steer Thursday at the Eddy County Fair with judge Justin James of Prosper, Texas. Hall also earned Reserve Champion in the event. 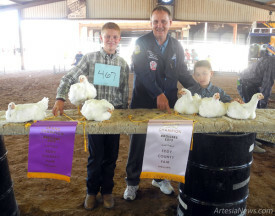 Belowt, Zackary Pinson of Cottonwood 4-H displays his Grand and Reserve Champion pens of broilers with help from judge Steve Beaty of Portales and Caden Golden.